That’s one of about three dozen amazing tidbits I learned about funeral customs during my conversation with Marty Mitchell, Funeral Director of Mitchell Funeral Home in Marshalltown, Iowa. Marty has a special interest in early 20th Century burial customs, and has an amazing collection of artifacts from that period. A social slap in the face to the community. Mr. Mitchell couldn’t understand how all this could have transpired in less than eight hours. Diphtheria equals fast burial? Not really. I asked about the claim that a communicable disease prompted the fast burial. Mr. Mitchell made the point that a century ago, it was contagious disease that usually took the lives of children, and yet they were not tossed into the ground immediately and unceremoniously. In fact, their funerals were also fairly elaborate affairs with embalming, wakes, viewing, and finally a burial. Typically, a Victorian-era funeral spanned about three days, from death to interment. In 1901, embalming fluid was made with arsenic and lead, and it was a powerful disinfectant. As I suspected, Addie’s black dress shoes were also a point of interest. In 1901, a woman’s shoes were removed when their body was prepared for burial, and “burial slippers” were then placed on their feet. Mr. Mitchell explained that burial slippers were made of CLOTH, not leather, and they would not have endured through the years. The black shoes prove that Addie was murdered, and that old Enoch didn’t even have the decency to give his young wife a proper burial. If Addie was sick, those shoes would have been removed when she went to bed. If her body was prepared for burial, those shoes would have been removed and burial slippers put on in their place. Ah, but there’s still more. According to Mr. Mitchell, vaults were widely used in this time period, commonly made of metal or brick. Less commonly, pre-formed concrete slabs were inserted into the grave. The vaults had no bottom, just sides and a top. They were expensive, so it was the well-to-do who had vaults for their loved ones. And what about Addie’s shallow grave? Mr. Mitchell explained that traditional grave depth was planned to provide a minimum of three feet of earth atop the casket. 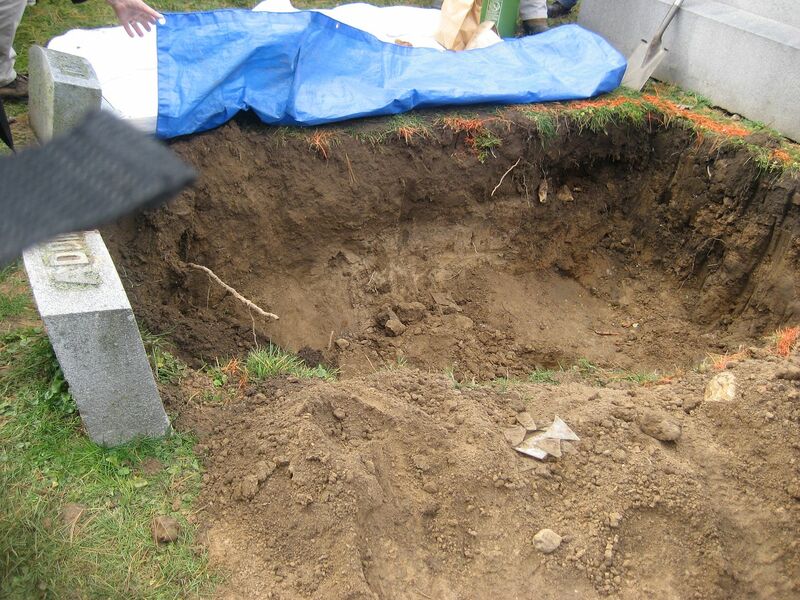 Adding in the casket’s height and a domed vault, created a grave depth of about six feet. In conclusion, I think Mr. Mitchell is right. I think an animal did deal with Addie’s remains, but it was the two-legged kind. 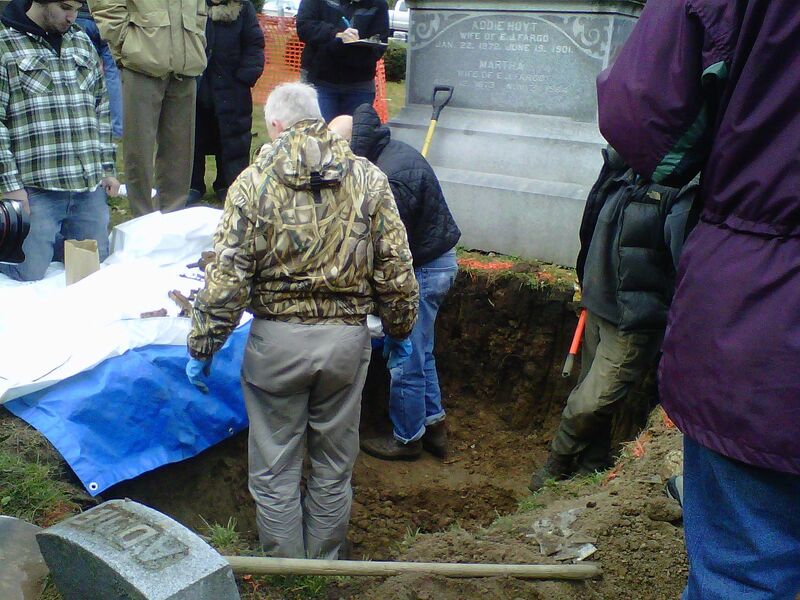 This photo really shows the shallowness of Addie's grave. The day of exhumation, we arrived with buckets and ladders and ropes and shovels, ready to dig down to six to eight feet. This grave is just beyond knee-deep. 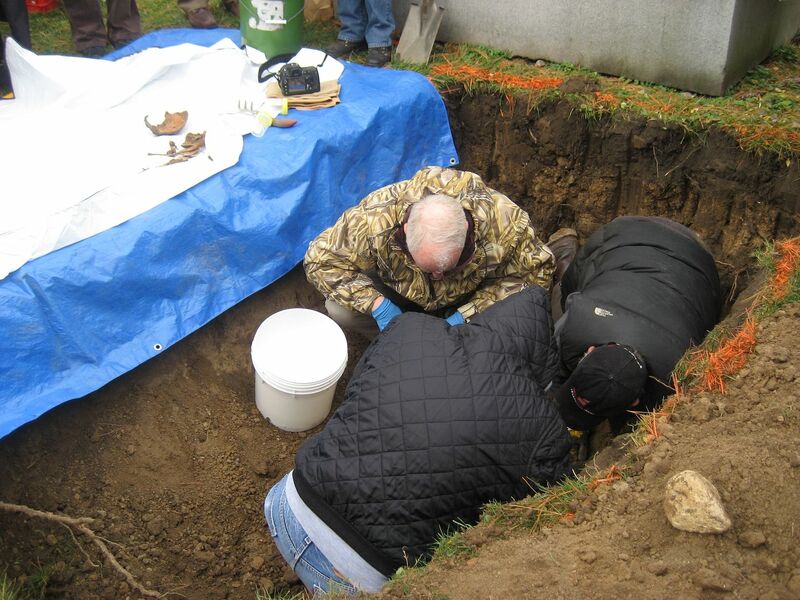 Dr. Fred Anapol and a student examine Addie's remains. 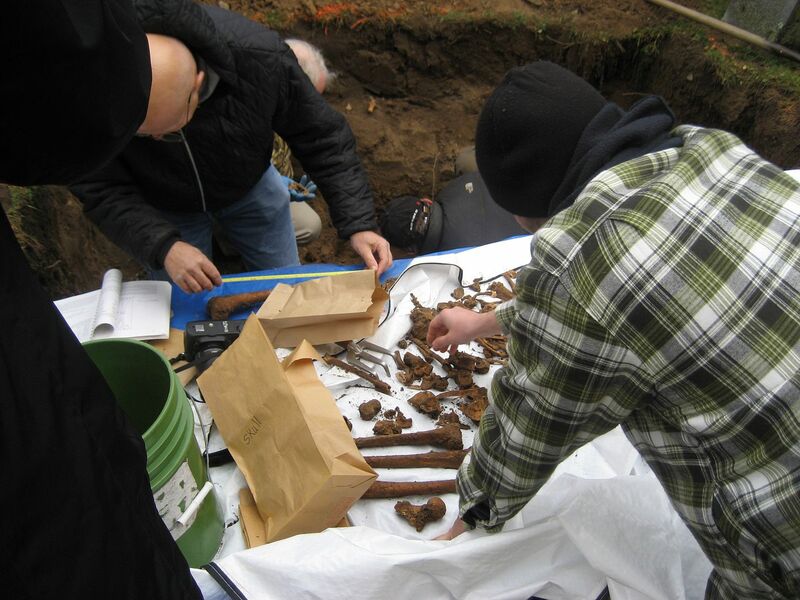 Dr. Peterson and Dr. Anapol carefully extricate old bones from the grave site. Addie's days in a shallow grave are now over. 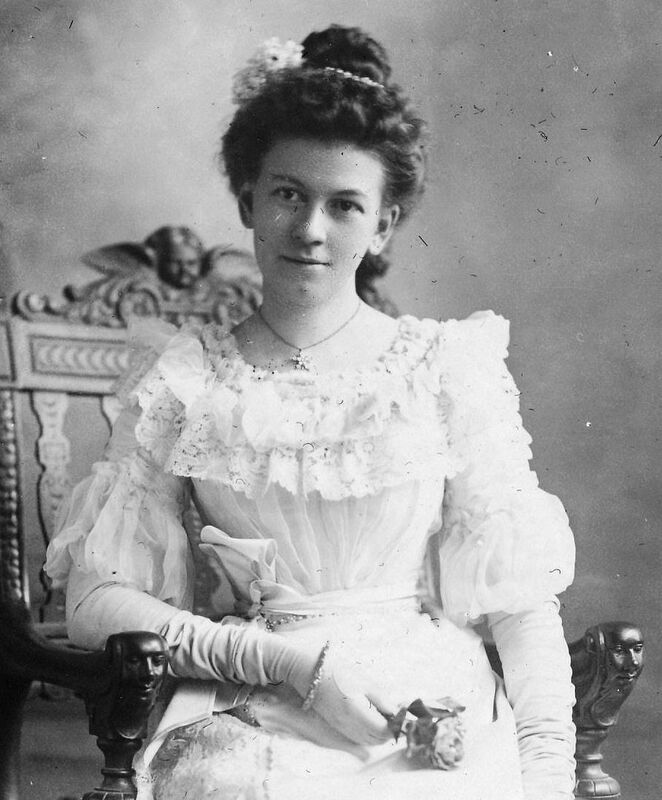 Addie on her wedding day, February 1896. She was 24. To see Addie in her beautiful dresses, click here. Another expert on funeral customs at the time weighs in. Those scales have almost tipped over. Awesome research Rosemary! Anyone who refutes this hasn’t taken the time or effort to do their own research. You are doing an excellent job proving that Addie was murdered. Considering Addie’s social status, her burial is full of errors! There is no arguing that this was not a proper burial for the Victorian era. Anyone who doesn’t believe she was murdered after seeing all of the research you have provided needs to start digging and finding proof otherwise. If I were on a jury trying this murder I would say GUILTY without a doubt! Mr. Mitchell confirmed what I had been thinking since you had Addie’s body removed. Addie was improperly buried without aid of a mortician and without the dignity and pomp and circumstance that her social position in life warranted. She was buried without her everyday jewelry, even her wedding ring apparently but placed in her grave in her everyday clothes and shoes, her coffin nailed shut. Her sister was never notified by the grieving husband that she had died and given the opportunity to return to visit her final resting place and pay her respects to the mourning husband. Her shallow grave could have been, and perhaps it was, invaded by animals and the remains scattered across the Lake Mills’ countryside. Wonder if Enoch paid someone to keep an eye on the plot to be sure that if it were disturbed that it was put to rights again because the cemetery became involved. Oh but to have a ghost whisperer that could talk with Addie about her last days on earth. You have presented irrefutable evidence of extreme foul play! Don’t give up Rose, you are doing such a wonderful job getting to the truth. I know you have had pit falls and so many challenges since you have taken on this cause, but you are strong and the only voice that Addie has or maybe ever had! A murder is a murder is a murder, no matter how rich or prominent the murderer! One thing that has come to mind is the Mourning Cards which were a part of the funeral procedure. I looked online and found this on the Mitchell Funeral Museum page. These items, done in black for adults and white for children, were professionally printed following a death. Since many families were distant, they could not attend the funeral, so these were presented to them as a remembrance. Some were large enough to hang on a wall. I seriously doubt that Enoch went through the trouble of ordering these cards for mourners. Rosemary: Have you read Mary Wilson’s “A History of Lake Mills,” self-published in 1983? The book is a jumbled mess, but some comments about Addie and Enoch Fargo are interesting: At Addie’s death the “doctor was quoted then as having said, ‘No one was fooled.’ It was only during the last 2 years that the descendent of E.J. Fargo was informed by those who thought that she should or could be protected from that part of history decided to contribute the information and let it fall wherever. A number of persons who knew Mr. Fargo will tell the same story–he shot Addie! (pp. 274-5). I don’t know who the descendent of E.J. Fargo was/is; she was told in 1981 or 1982. Perhaps you do? Margot Peters, Lake Mills resident since 1973, friend of the late Mary Wilson. Just thinking, Enoch probably buried Addie shallow for many reasons - in a hurry, possible animal intrusion, but also, as a concrete buyer, user, and home builder, Enoch would also have been very aware of the effects that frost would have on a shallow grave and the remains placed in it, especially over a period of time. One way or another, the evidence would be reduced dramatically over time. Smart at the time, but ultimately, it’s what got him caught. I never could have imagined that my casual research into Sears kit homes would lead to a murder mystery story! It seems like there is no proof that Addie was killed with a gun, so how did the accusation originate? I was also wondering if you ever saw Enoch’s own grave, and found out whatever happened to his second wife.